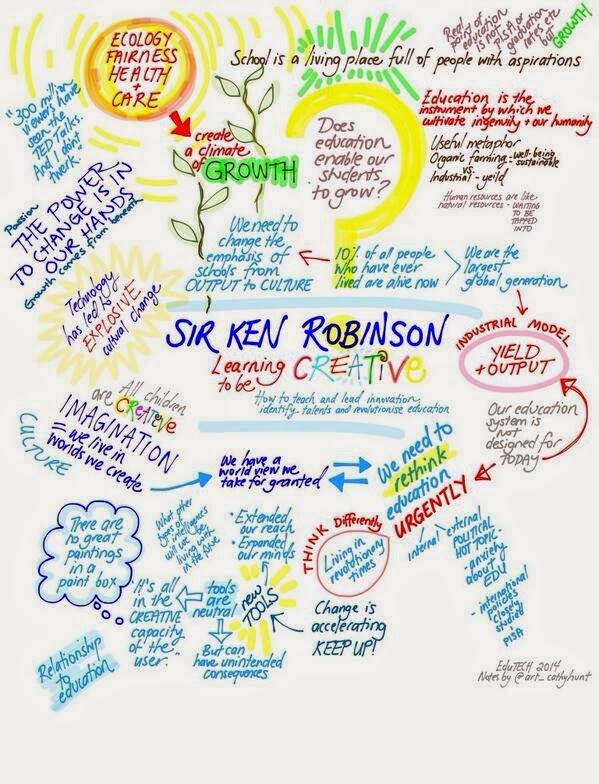 I must admit, I've got a bit of an educational crush on Sir Ken Robinson. He's an enormously engaging speaker, and I've quite enjoyed his TED talks (How Schools Kill Creativity, Bring on the Education Revolution and How to Escape Education's Death Valley), books and articles. Robinson gave a rather entertaining keynote on the first day, as well as more of his insights during the gala dinner that evening. While much of what he says is stuff that he's said before, I think the value lies in the delivery. He has the ability to make an audience of nearly 5000 people laugh, Tweet like crazy and walk away inspired; and with the message that he's delivering, I think that's a good result in itself. So, what was his message? Well the first one that I picked up (and Tweeted) was his discussion about educational leaders and the GERM (Global Education Reform Movement). While most of us involved in education understand the need for educational change (as outlined in my last two posts), Robinson said that the leaders and policy makers (who "pass through education without touching the sides") that are so carefully studying our schools and our outcomes (mainly via testing regimes), don't really know much about education, but feel quite confident about passing judgement on it. This has meant that the changes that are really needed just won't happen. Robinson also talked about change. The rapid pace of change in many areas. He talked about technology; how tools "expanded our mind and extended our reach, and brought a whole universe into our grasp". But he also talked about how tools are 'neutral'. It's the creative capacity of the people that use the tools that give them life. Robinson gave the example of the cupboard full of instruments that is nothing until people pick them up and play them. So tools are great, technology tools are great, but without people to use them in purposeful ways, they are rarely going to be useful. He also talked about population growth. Our current generation is the biggest since the dawn of human history. The biggest rate of growth is in the third world, and it's in cities. This will have an enormous impact on quality of life, work, resources and education. The effect of population growth in the past led to industrial farming methods and all those things that we're now finding are causing problems: technology that made farming quick and easy (combine harvesters etc); chemical fertilisers; and pesticides, because the monocultural farms produced by these advancements produced ecosystems that lacked diversity and were prone to disease and pest invasion. This was good for a while, but we now find that the topsoil is eroded and nothing grows without a lot of artificial intervention. It's taken essential nutrients out of our diet and led to the rise of processed and fast foods (and all the associated problems). Robinson argued that this industrialised farming was a result of the technology and the mindset at the time. It's all about yield and output. Robinson then argued that this is what education is at the moment: yield, output, big data, PISA, etc. And that it, like industrial farming, is not sustainable. Nice analogy, huh? The good thing is that the problems we've had with food and health have led to the growth of organic farming; with the emphasis on the soil, rather than the plant. Robinson argued that we need to move to organic education. Education that is not focused on yield and output, but on culture (well-being), ecology (diversity), equality (fairness, justice, equity) and care (focused on all aspects of the system). For many students, public education is the only opportunity that they have, and we need to make big changes to ensure that everyone has that shot. The thing is, he emphasised that we need to change education from the ground up, rather than relying on the policy makers to make the changes for us. The school is the soil, the students are the flowers, the school leaders are the clouds and the government is the sun. So, continuing the farming analogy, Robinson's suggestion was that in schools, we need to concentrate on the 'organic' principles of culture, ecology, equality and care. Every school is a microclimate, and it can create its own culture. Governments come and go, but the people that actually do the work keep going. The principal's job is to shelter the microclimate from the harsh 'sun' that is government policy, and just get on with doing what they know is the right thing for their school and their students. And finally, Robinson argued that as schools, parents and students, sometimes it depends on the questions that we ask. If we ask 'how can we improve maths outcomes', then the energy goes into addressing that. If we ask 'how can we improve the life of that child, right now? ', then that's a different question all together. Many people will recognise Sir Ken Robinson's ideas from this RSA animation from 2010. Check it out if you haven't seen it! Also, check out this visual interpretation of Sir Ken's keynote by Cathy Hunt at the iPad Art Room. Cool stuff huh?